Track & Field Season is Underway! 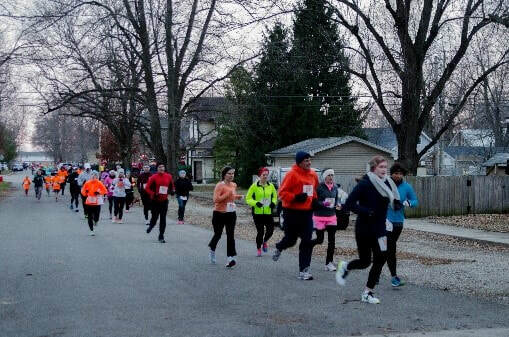 Supporting, encouraging, and promoting the rich and winning traditions of running in the West Liberty community with training advice, runner spotlights, and race information. We're proud to be BORN AND RACED IN WEST LIBERTY. Find out more about Ann Vogel, the founder of Born and Raced in West Liberty. Learn more about running in the community, including: RUNNING NEWS & EVENTS, TRAINING & WL-S HIGH SCHOOL RUNNING. What I look back on now is how the work ethic necessary to win at that level ingrained an understanding of what's needed to achieve anything in life." February marks the annual West Liberty-Salem Athletic Hall of Fame ceremonies and to celebrate, we'd like to honor the state champion 1977 Big Orange cross country team as our February Spotlight Runners. Team members Scott Bacher, Ken Day, Corey Frost, Bruce Hooley, Jeff Parker, Mark Plank, and Butch Sower, along with Coach Ken Lehman who will inducted into the West Liberty-Salem Hall of Fame the weekend of February 9th and 10th. The 1977 team overcame adversity including an injury that sidelined the team's number one runner Earl Zilles for the season, to win its second consecutive Ohio Class A state title. Some of the team members took time to share some of the 1977 season's memories with us. Read More...including a Q&A with members of the 1977 Big Orange State Champs with Born and Raced in West Liberty and see past Spotlight Runners!